No one can promise that you will catch fish all the time. For as long as we ve been catching fish, fish have been outsmarting us. Part I: Before the Bite. Chapter 1: Getting Hooked on Fishing. Chapter 2: Gathering What You Need to Fish. 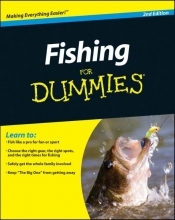 Chapter 3: Finding and Evaluating Water for Fishing. Chapter 4: Putting a Face on the Fins: Common Freshwater Fish. Chapter 5: Familiarizing Yourself with Common Saltwater Fish. Chapter 6: Staying Safe On (Or Near) the Water. Part II: Gearing Up Without Going Overboard. Chapter 7: Hot Rods and Cool Reels. Chapter 8: The Bottom Line on Line. Chapter 9: It`s Terminal (Tackle): Hooks, Sinkers, Snaps, Swivels, and Floats. Chapter 10: Going Ahab: Fishing from Boats. Chapter 11: Gadgets Galore: Fishing in the 21st Century. Part III: The End of Your Line: Enticing Fish with Bait, Lures, and Flies. Chapter 12: Real Food for Real Fish: Using Bait. Chapter 13: It Only Looks Alive: Tricking Fish with Lures. Chapter 14: Fish Don`t Fly, But Flies Catch Fish. Part IV: Now You`re Fishing. Chapter 15: Tying Popular Fishing Knots and Rigs. Chapter 16: Choreographing Your Cast. Chapter 17: Exploring Different Fishing Techniques. Chapter 18: How to Hook, Fight, Land, and Release a Fish. Part V: After the Catch. Chapter 19: Photographing and Preserving Fish for Posterity. Chapter 20: Cleaning Fish for the Table. Chapter 21: Biting Back: Cooking and Eating Fish. Chapter 22: Ten Fishing Lessons You Don`t Have to Learn the Hard Way. Chapter 23: Ten Ways to Get Kids Involved in Fishing.